The Foundation slabs are financially more advantageous than monolithic. For its installation will require special lifting equipment, so care should be taken to the presence of access roads. The base of the slabs can be erected on any soils, including marshy. In Russian the most popular building slab, strip and columnar foundations. Among them, the highest load-bearing capacity has the first. For the construction of a slab Foundation it is possible to use a monolithic, hollow, and ridged product, as they all have sufficient bearing capacity to withstand the weight of low-rise houses. The base of the slabs has its advantages and disadvantages, which need to know the private developer. The main advantage of such a slab Foundation in that it has small ground pressure: up to 1 kg by 1 m. It is beneficial to seasonal changes in the soil. Plate during the freezing and thawing of the soil "works" as a monolithic platform: it is uniformly raised and lowered, which minimizes the impact forces of frost heave on the building itself. This feature slab Foundation lets call it "floating". Installation of floor slabs as the Foundation of the house is much less laborious and more rapid than in the case of the pouring of the monolith, where in addition to the device of the pit and the production casing, is required to mount the reinforcing mesh. For laying of floor slabs only need to dig a pit, line it bottom and make the dumping of sand and gravel (gravel). If the slab has voids, it has a higher sound quality than monolithic. As the best accumulator is the air, and warmer. 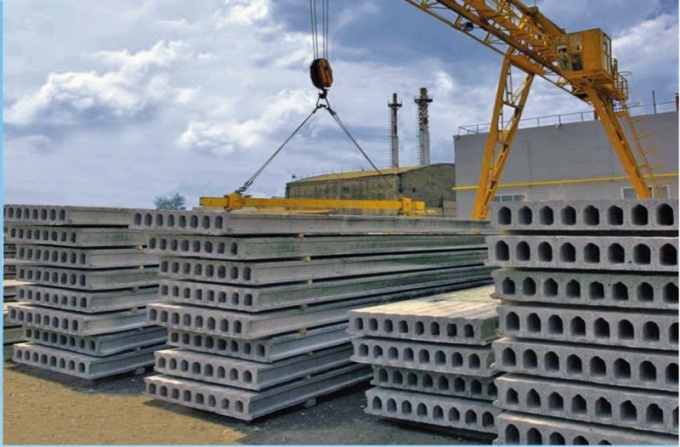 In hollow-core slabs used prestressed reinforcement, therefore, on the strength they are slightly inferior to the monolithic, but the price is cheaper. For these reasons, products with cavities are often used as a Foundation in low-rise construction. The plant for the production of concrete products, you can order a plate of the required parameters and sizes. The disadvantage of this Foundation is that when a large area of the structure it will be teams. This will require special care in the formation of the pit and align its bottom and backfilling, and also – when laying the tiles. In addition, the joints between the slabs will need to close. For installation of foundations need to know how to choose the right plate. If you intend to build a "light" building (frame house small area, similar to shield or of concrete blocks, the garage) as a Foundation you can use plates with a thickness of 10 cm for Example, you can use a continuous single-layer plate 1P stamps, with a thickness of 120 mm. If the structure is solid, you will need concrete products with greater load-bearing capacity with a thickness of 200-250 mm. Such plate is equipped with ribs. If the product has voids, they can be used for the construction of communications.